Originally uploaded by Smiles for the world. Disappeared from the previous post! If you've ever seen Sean Connery fly around in Thunderball, you know what this is. A doggone Rocket Belt. Developed by Bell Labs in the early 60's, it was abandoned for military use because it doesn't fly too long. And it can be yours for just $250,000. If I were a rich weirdo living in Orange County, just waiting for the San Andreas fault to drop me into the ocean, I'd totally buy one. Really cool use for a Doodle Pro! This one is for the older kids, and the ones with a DIY streak in them at that... Here's a nifty how-to on making a "plot bot" with some "spare" parts: AVR-baseed analog plotbot with an E-Paper display. Not for the faint of heart! You'll also need an antique plot recorder, which I haven't seen in ages. OK, upon further review the Shake'n'go planes aren't so bad. 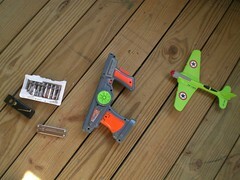 It took a little training for the kids, and maybe the launchers go get used to us, but they work really well now. The trick: gently load the plane until it clicks ONCE. Teach the kids this, and it'll start up the noises. Tilt down and up (the nose), or up and down, and it'll start pulling back. The blue one and green one get good air, but the blue seems to get better distance-- sometimes! Very cool. These are some expensive toys! Would you pay nearly $50,000 for a remote-controlled robot? You might if you're the target demographic for Hammacher Schlemmer. I remember getting this catalog as a kid (ok, my parents got it, but never ordered anything) and drooling over the geegaws. H-S does put some big-ticket items in the catalog as a sort of "wow" factor, but $49,000+ for a working "Robby the Robot?" Wow. CNN Money has a very cool slideshow with some other high-end "toys," although a couple aren't really for kids, and the first 2 are play houses... That Pirate Scallywag play house is SO cool though! Instead of buying one, I think I'll build one instead. We're big fans of the Shake'N'Go race cars from Fisher-Price. Now the F-P wants us to take to the skies. What next? Shake'n'scuba? Anyway, the Show Plane is a decent toy. The idea is you pull back on the catapult and release the plane to make it fly. 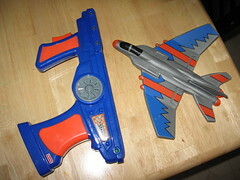 But here instead of pulling the plane back (which you can do), you shake the entire launcher, and one tiny clip at a time, the plane inches backward. A nice idea, translating the shake'n'go concept to a flying machine, but in practice they have a few problems. First, you have to insert the plane just right to engage the motor. Since it's a little tricky, and you can't pull on it too much or the "motor" won't start (it makes an engine noise), my son got a little impatient and just decided to start pulling it back. To do this, he's got to yank on the back of the plane. 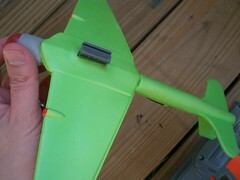 Ours is the green plane, which is kinda skinny and I worry the glued sections will rip apart. Besides, having to use batteries for something that shouldn't need them is silly! In my day we had a crossbow and we liked it! Really the boy had a great time though. It's a fun toy-- just make sure you educate the kids on how to use it. I think a little more practice and he'll go nuts. He played with it for over 30 minutes outside. That, to me, is quite good for a single toy. And he's quite interested in playing with it again tomorrow. The box was astoundingly easy to open. Not as many of those twist-ties. We'll see how battery life goes, and the structural integrity. Although we might exchange it for the other one if he keeps tugging on it. Final thought: get it on the cheap for a neat flying toy appropriate for younger kids. Check out our picture gallery via this link for more details. The unit we got probably needed batteries. They keep them live in the box, so a lot of shakes and sounds had run through the 3 AA's. The toy opener's friend is the Leatherman! 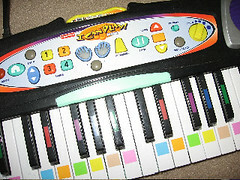 The Fisher Price "I Can Play Piano" is the modern successor to the old Miracle Piano Learning System (which used to be available for your computer or Nintendo Entertainment System). It comes with an AC adaptor, and plugs into your TV with an attached (and not removable) set of RCA cables. You can play just the keyboard without a TV, but the sound is limited and there are no special features when you play without a TV. So how does it work? There are just a few modes, and our 5 and 3 year olds can set it up quite easily. There's a game mode for learning the keys, a song mode for playing along, and a freestyle mode for just banging on the keys, haha. But does it really work-- does it teach the kids to play piano? Sadly, no. I had hoped the keys would light up, as some do. Instead, they are color-coded, and you press the appropriate color when prompted by the game or song. The problem here is that the kids have to move their eyes from keys to screen, quite rapidly, even on the easiest settings. This really only encourages them to slap at all the keys, in hopes that they'll score points. So you'd have to stay on them pretty closely for this to do any good. It isn't bad, but it won't make them into a concert pianist overnight either. Bigger review with screenshots coming soon! These little puzzles are great for teaching numbers. One side presents the "problem" (either a counting tile, like 3 bees, or a math tile, like 1 apple being subtracted from 3 apples), the other side that fits is a number-- the correct answer. But with one kid at 5 and one at 3... Well, one does math and the other is still learning to count. 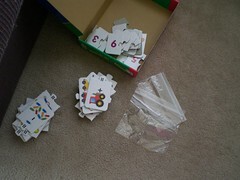 So we just use some bags to divide up the math tiles and counting tiles. There are enough numbers for either at any time, so we just let those sit in the box. Cheap, but a great way to reduce setup time and reduce frustration for the kid playing.